I’ve driven the future. 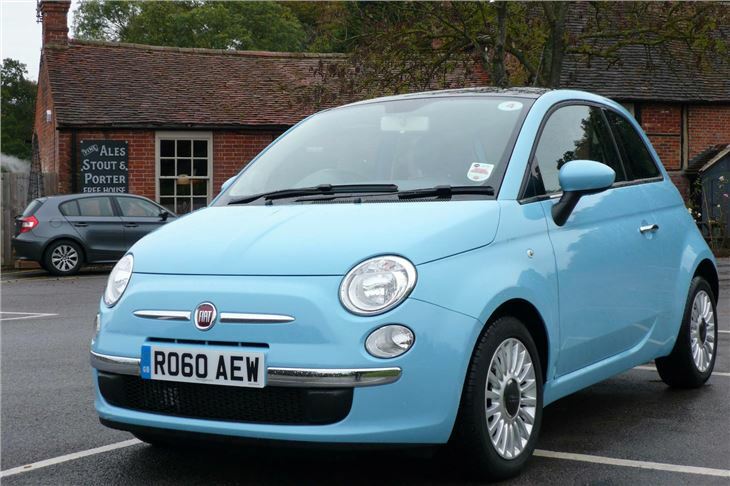 And it’s probably my future, too, because I’m thinking of replacing my FIAT 500 1.2 with one. 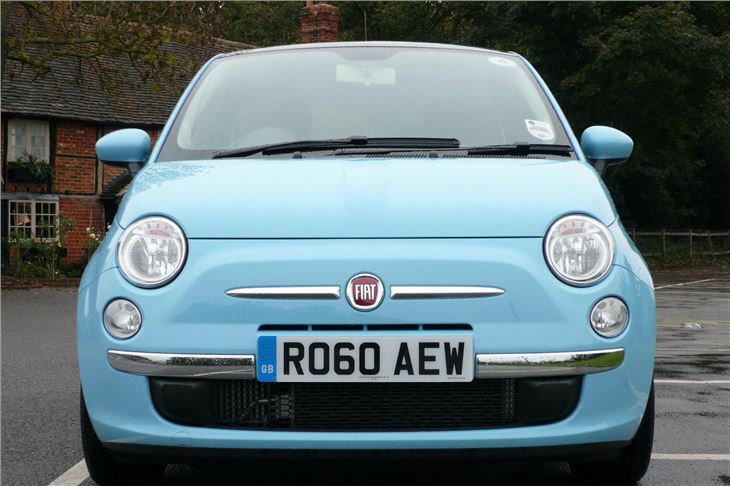 The FIAT 500 TwinAir is the greatest leap forward in engine technology for 20 years. A team of FIAT engineers led by Giovani Mastrangelo have taken FIAT’s MultiAir valve operation and applied it to an all-new 875cc twin cylinder turbocharged engine. 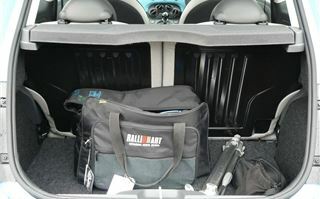 The result is a very useful 85PS from just 875cc. But, far more relevantly in our ECO conscious age, is that this extraordinary petrol engine emits just 95g/km CO2. The lowest emissions of any petrol engine anywhere in the World. ‘Free’ annual road tax and, now confirmed from 4th January 2010, no London Congestion Charge are just two of the benefits. 68.9mpg combined (70.6mpg combined for the Dualogic automated manual) are another. Even being realistic, this corresponds to better than 60mpg in everyday use. And on top of that, the engine has enormous character. It’s basically the engine the FIAT 500 was waiting for. Generating very little friction, it revs extremely freely, but the electro-hydraulic inlet valves prevent it from over-revving. It has a characterful noise, a bit like the original two-cylinder Honda N600 of the 1960s. But it’s much more powerful. Sixty miles an hour comes up in 10.7 seconds compared to the 12.6 seconds of the 69PS 500 1.2. Top speed is 108mph instead of 99. And, of course, the car has the suspension improvements developed by Ford for the Ka, then refined by FIAT for the 500 Abarth and 500C before becoming standard across the 500 range from 2010 model year. 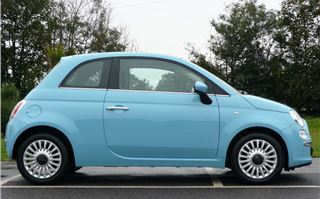 Together they transform the 500 from a car you forgive because of its looks into a really fun drive with excellent ride quality. Happily, gone is the super-light ‘City’ steering assistance mode, which I can’t believe anyone ever used because it turned already lifeless steering into a completely feel-free zone. 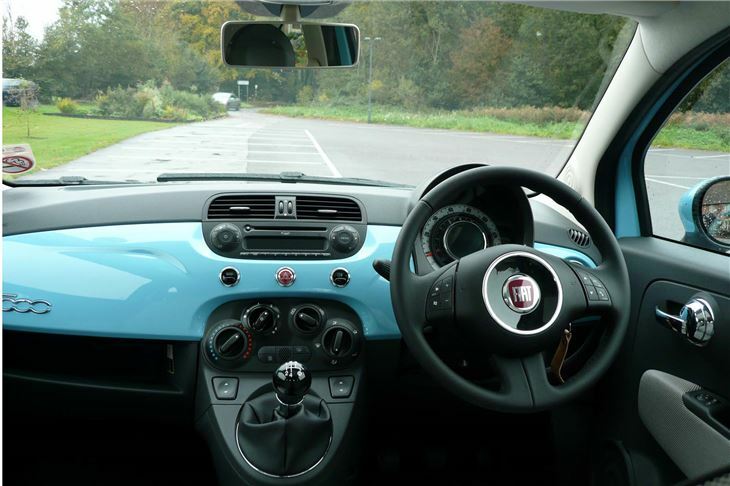 The TwinAir has great steering that puts you fully in touch with how the front wheels are gripping and what’s happening at the back. In place of the ‘City’ switch, the TwinAir has an ‘Eco’ button, that cuts engine torque and hence aids economy. And it’s in the area of torque that I needed to re-learn how to drive a 500. Running on Shell V-Power, my 1.2 is very sweet at low revs, happy to run at 30mph in 5th, corresponding to around 1,300rpm. The TwinAir is geared the same and, though its maximum torque of 145Nm at 1,900rpm is much greater, there’s nothing much there below that, so you need 4th in a 30. At speed, though, the engine smoothes out beautifully and is very happy to cruise quietly at 60mph. The big difference between it and the 1.2 is that, if you want to accelerate from 60, instead of slowly gathering pace, you can quickly get up to 70 and illegal speeds above that. Soon there will be more TwinAir developments: a 65PS version without a turbo, and a 105PS turbo that will render the 100PS 500 1.4 completely redundant. 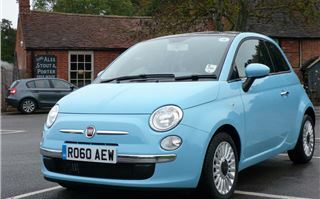 The 65PS and 85PS versions will also find their way under the bonnets of next year’s new FIAT Pandas. In the meantime, though, the FIAT 500 MultiAir gives you your cake and lets you eat it. It’s fun to drive, characterful, yet extremely economical and so low in CO2, it’s tax and Congestion Charge free. London is going to be full of them. 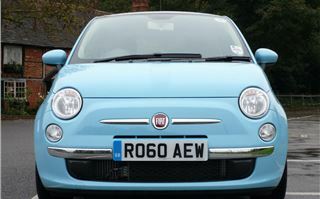 The EC Certification Tests for the FIAT 500 TwinAir give it 95g/km CO2 (so free annual tax and no London Congestion Charge). But this also translates to a combined fuel economy figure of 68.9mpg, and no one seems to have come anywhere near achieving this. I got 35mpg while filming it, ‘Autocar’ got 35.8, the boys at Top Gear got 38, George Fowler of The Star got 42 having fun and 62 driving it as economically as possible. My own 500 1.2 has averaged 48.83mpg over 11,750 miles. That isn’t the consumption meter reading (it resets every 2,000 miles anyway). It’s the fuel log of total fuel used over 11,750 miles. Over Christmas and New Year I made two 600 mile journeys in it and the average over them was 46.91mpg. So I wondered if the 500 TwinAir would beat it. Over the same journey. In similar conditions. Averaging the same speeds of around 58mph (300 miles in just over five hours). And today I found out. After the first 300 miles the meter said 49.4mpg. After the second 300 miles, that had fallen to 48.3mpg. Taking the total 610 miles covered and dividing them by the 12.7 gallons of fuel used, it averaged 48.03mpg. Not shamefully short of the meter reading. And a little bit better than my 1.2. Obviously the EC Certified figures were achieved in ‘Eco’ mode in which the TwinAir actually develops less power and torque than the old 1.2. The problem is, with the Eco mode switched of,f the 500 TwinAir is a hoot to drive. Almost as good as the 500 Abarth. 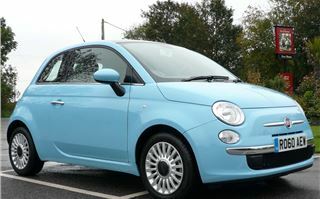 Which is why testers trying the car for a few hours or for a week on FIAT’s petrol only get 35mpg on the consumption meter. And why, by judicious use of the Eco mode, I got 48. But on the motorway, what sane driver wouldn’t leave it in Eco as much as possible? Why deliberately use more fuel than you have to in order to average pretty much the same speeds? Okay, you do find inclines you didn’t know existed, but it’s not that bad and if you lose too much speed you can always switch Eco off momentarily. M1 Southbound on a Sunday South of Leicester? You're lucky to do 60 and the fastest lane is the nearside. There are 17 miles of 50mph contraflow befoee you get to Luton. So why do you need to be in anything other then Eco? 85 miles of my runs were cross-country, over my favourite road that has every kind of corner (apart from hairpins, every kind of incline and every kind of surface ranging from racetrack smooth to rally stage rough. Today, part of the route was washed out as well. The roads became rivers of muddy water that the surrounding fields could not absorb. That showed up the biggest difference between my 2008 500 and the current car with its vastly improved, much softer rear suspension. 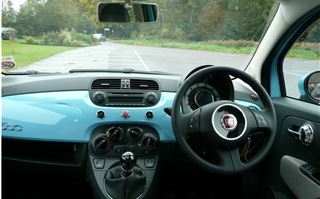 Instead of hopping round corners, the TwinAir simply gripped, almost as well as an Alfa Mito set to ‘All Weather’. It was really that good. 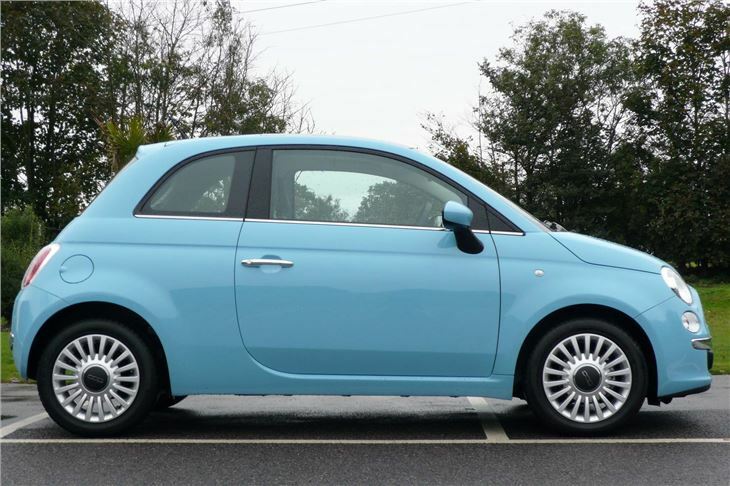 If you have to drive into London regularly and want something that’s stylish as well as fun, and very low on BIK, a FIAT 500 TwinAir is the only obvious choice. Everything else that’s Congestion Charge exempt is a hybrid or a diesel, or is the Toyota IQ or the Hyundai i10 Blue. Happily, though you won’t ever get anything like the EC combined mpg figure, you will do a lot better than 35mpg. Even on a 600 mile run.